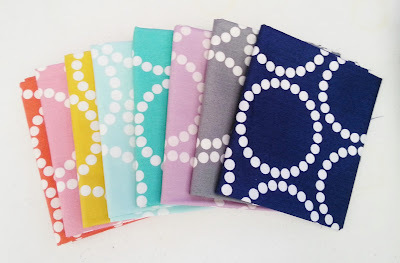 This post is part of an ongoing series of posts where I document my fabric stash purchases. This year I am trying to keep track of my fabric intake in order to see how much I consume. I'm not going to keep track of how much I spend, though, because then I might cry. I purchased these Pearl Bracelet FQ's probably sometime in early spring, but since I'm trying to keep track of my fabric purchases this year I'm posting pics long after the fact. ...Just trying to be honest with myself in regards to my fabric buying habits. Hello Emily,Love your Blog Header and would like to know the name of the Block on the far left of the Header? Is this a quilt of yours? So neat! Thanks you, Linda! The block is a "kaleidoscope" block. The picture in the header is a mini quilt I made for DQS13 (doll quilt swap on flickr) in the spring. The pattern is a paper pieced one from Pitter Putter Stitch.